Battle other players. Try to push them off the island. Become the king of the map by pushing everyone outside of its perimeter in the new Bumper.io game! You will experience a ton of positive emotions by knocking your opponents off the stage with your awesome bumper. In order to win you need to take all the other players out becoming the only one remaining on the map. Cover your six - there's a button there, and if someone hits it you will fly away with a high acceleration. Destroy the competition that gets in your way and grow your rating. 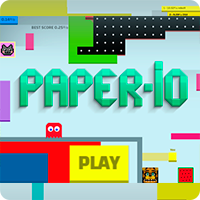 Try the super fun Bumper.io game and become the leader of the map!